Belgian Police Identify Suspected Accomplice Of Salah Abdeslam : The Two-Way Police say they've learned the true identity of one of the people allegedly involved in supporting the Paris attacks. That suspect is Laachroui Najim, who used a fake name and is wanted for arrest. Using fake identity cards, Laachroui Najim posed as Soufiane Kayal (left), and Mohamed Belkaid posed as Samir Bouzid when they worked with arrested terrorism suspect Salah Abdeslam, police in Belgium say. 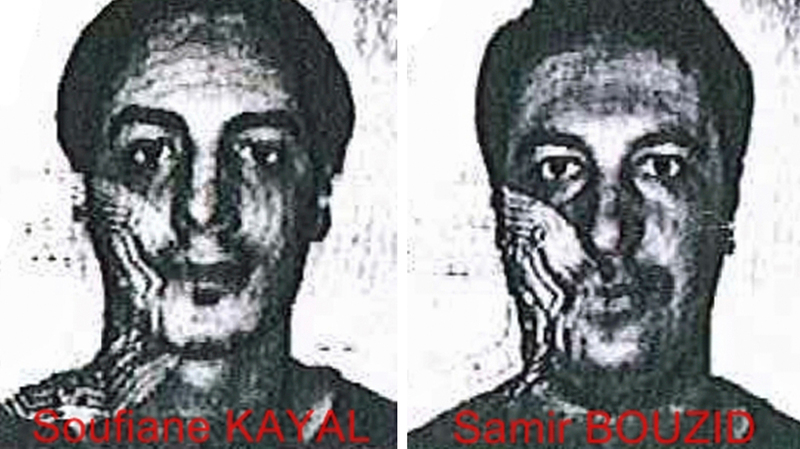 They're seen here in handout photos from the Belgian police that were released on Dec. 4. The manhunt for terrorism suspect Salah Abdeslam ended with his arrest Friday — and on Monday, police said they've also learned the true identity of one of his alleged accomplices in the deadly Paris attacks in November. That suspect is Laachroui Najim, who used a fake name and is wanted for arrest. Police say Najim, 24, used the alias Soufiane Kayal to rent a safe house used by the attackers in Belgium — and that he's one of two men who were with Salah Abdeslam in a car that was checked by Hungarian police on Sept. 9, according to the Flanders News website, which adds that police say they found Najim's DNA at a safe house used by the terrorists. The other man in that car died last Tuesday, when police conducted an anti-terrorism raid in Belgium. He had initially been identified as Samir Bouzid — but police say that was a fake identity, and that the man was actually Mohamed Belkaid, a 35-year-old Algerian. Belgian news site RTL reports that investigators believe there's a high probability that Belkaid was one of a small number of people who received a text message on the November night when ISIS operatives attacked civilians in Paris. The message read: "We left, we begin." News of Najim's true identity comes as authorities interrogate Abdeslam, who was injured but captured alive Friday during a raid in the Molenbeek area of Brussels. Abdeslam is being held in a prison in Bruges. His fingerprints were found in the home that police targeted Tuesday, in an operation that began as a check on what was thought to be a vacant apartment that was linked to the attacks. Instead, a gunfight erupted as suspected terrorists opened fire on police. As NPR's Dina Temple-Raston reports for today's Morning Edition, Abdeslam is now being questioned — and he's apparently giving at least a measure of cooperation. "Not surprisingly, authorities are keeping a lot of what they are learning close to the vest," Dina says. "Abdeslam reportedly told them that he was supposed to kill himself outside the stadium that night but didn't go through with it." Dina also notes that Didier Reynders, Belgian deputy prime minister and foreign affairs minister, held a news conference Sunday to say authorities had found weapons that might have been used in future terrorist attacks in Belgium. "He didn't say what those weapons were, precisely, or whether Abdeslam told authorities where to find them," Dina says. Among the things French and Belgian authorities hope to learn from Abdeslam, Dina says, is how many ISIS operatives might be poised for future attacks in Europe. Dina notes that as a rule of thumb, counter-terrorism officials believe each terrorist would need three to five people supporting them in order to carry out an attack. Noting that a witness to one of the Paris attacks said they saw what looked to be encryption software on one of the terrorists' laptops, Dina says, "Abdeslam could, presumably, know about that too."